SUNBURY – Winter weather predicted to hit the Valley came at a more rapid pace through the mid-morning and afternoon, leading to some closings and traffic problems. 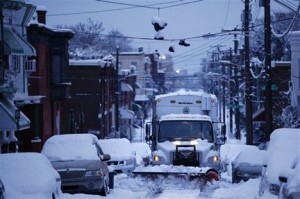 According to AccuWeather, about five to six inches has fallen. Many Valley schools had already closed or dismissed early. Lots of Valley businesses also closed early and many events around the area have been cancelled. See a complete list on our WinterNet page. One accident has also been reported in Ralpho Township, Northumberland County. Northumberland County Communications says the accident occurred just after 1:30 p.m. on Route 54 over the Natalie Mountain. County communications says the crash occurred when a tractor-trailer slipped, causing another vehicle to hit it from behind. No injuries were reported.